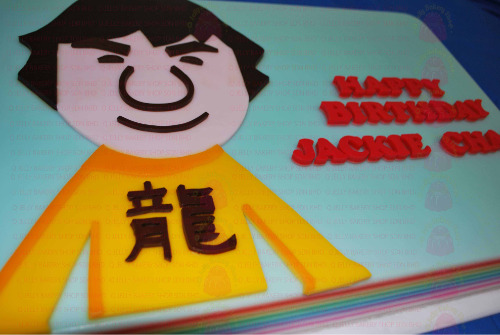 Jackie Chan celebrated his birthday at the press conference earlier. Happy 55th Birhday, you! STAYING healthy and fit is all the rage now, but how can you possibly resist the temptation to sink your teeth into one of those sinfully delicious desserts that you so deserve? Perhaps controlling your eating habits could be the answer by having one dessert every few days and then hit the gym right after before they go straight to your thighs. Artistic touch: Stephanie Yong has been in the business since 2006 and she has done more than 1,000 designs of jelly cakes. Or perhaps it is restricting yourself to having only one dessert on special occasions and pray that you won’t physically resemble that big, fat, calorie-laden moist devil’s chocolate cake that you had devoured. All these sound pathetic, no? If you had answered with a resounding yes, fret not as there is an answer for those who love their desserts as much as they love their waistlines. Snuggled somewhere in Bandar Puchong Jaya, in Puchong, Selangor, is a bakery shop that has been getting a lot of raves not only from adults but from children as well. You can see the little kids standing close to the glass door of the shop, squinting their eyes, trying to get the best view of the desserts. The ‘action’ doesn’t stop there as they would wheedle their parents into entering the shop and buying the desserts. “It’s so cute to see how they would cajole their parents into giving in to their demands and just looking at them makes me feel like I’ve done something right,” says 33-year-old Stephanie Yong, owner of Q Jelly Bakery Shop. The bakery has been in business since 2006 and it specialises in something that may never have crossed your mind – jelly cakes. These adorable jelly cakes come in different designs, from Barbie dolls with big gowns and fruitcakes to animals at the zoo and Marvel superheroes. “The difference between my jellies and those of others is that not only are they low in cholesterol, they also contain nearly 87% water and are rich in vitamins as well as other important nutrients. “The food colour dyes are approved by The Food and Drug Administration (FDA) in the United States. “On top of that, most of them do not contain eggs or dairy products and they are certified as halal,” she explains. More than 1,000 designs of jellies are available for you to choose from and they even do custom-made ones, according to your heart’s desires. There are quite a number of flavours, too, like Pandan, strawberry, chocolate, mocha, blueberry, fresh mangoes, honeydew, watermelon, dragon fruit and orange. According to Stephanie, the hot favourites so far are the pandan-flavoured Barbie dolls and the chocolate-flavoured aquatic designs. “We also welcome those who bring their own pictures for us to design and they get to choose the flavours they prefer,” she adds. The whole idea of making jellies came from her mother who was an avid cook and would spend most of her time educating Stephanie on baking and cooking at home. “She even got me to take up baking and cooking courses just so I won’t forget whatever she had taught me earlier,” Stephanie says. Like many little girls who were exposed by their parents to do a certain task, Stephanie in the end grew fond of making these sweet gelatine desserts so much so that she decided to make some for her friends and family just to see their reaction. “They absolutely adored them! Some suggested that I do it as a business so here I am, doing this for two years already,” she exclaims. What most people don’t know is that jellies come in different grades, thus some would be more expensive than others. “Most of my products are from Japan and, to me, they are the best jellies one could find because of the smooth texture and they do not contain food additives and are animal-product free,” she explains. It is advisable that you finish the cake on the day you buy it but should you need to keep it, the longest period is between four and five days, and at a temperature of below 10°C. Stephanie has two outlets: one in Ikano Power Centre (Lower Ground, next to the bowling alley), and the other in Bandar Puchong Jaya. If you would like to visit the one in Bandar Puchong Jaya, the address is No.15, Jalan Kenari 18B, Bandar Puchong Jaya, Puchong. Call her at 03-8076 1159 if you have questions and log on to www.qjelly.com to see the list of designs. Wobbling about the right decision for a celebration? Take a cue from SHERRINE JAY who found colourful inspiration at Jellyland. WANT to infuse a dollop of fun in a party? Looking for ways to enliven the table for special occasions? There’s something for all ages at Jellyland. Stephanie said Q Jelly’s cakes are highly sought-after for Mother’s Day, Father’s Day, Christmas, birthdays, full moon, and wedding celebrations. The vibrant and diverse colours used to design the cakes have apparently captivated customers with kids as they keep coming back for more. 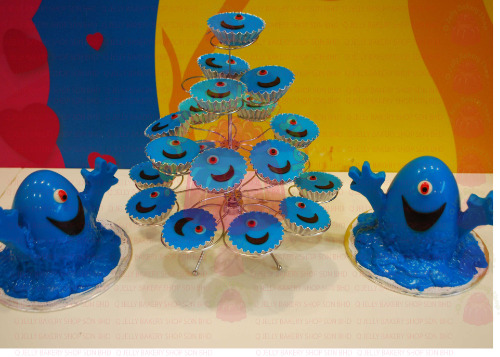 “Since most of our cakes’ designs come in various colours and the majority takes the form of cartoon characters, they are a favourite in kids’ parties. 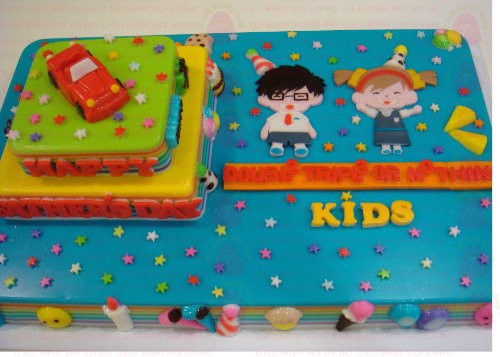 But, I must say, there are those ’young at heart’ who also love our cakes,” she said. 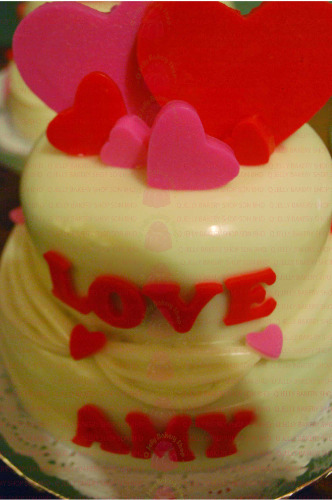 Q Jelly’s cakes have also apparently found a place in the hearts of vegetarians. “Jelly-based cakes usually do not contain eggs and dairy products, except those that are chocolate-flavoured. Some of my elderly customers are lactose-intolerant and some of them have lost their teeth due to old age. They have no problems eating my cakes,” said Stephanie. 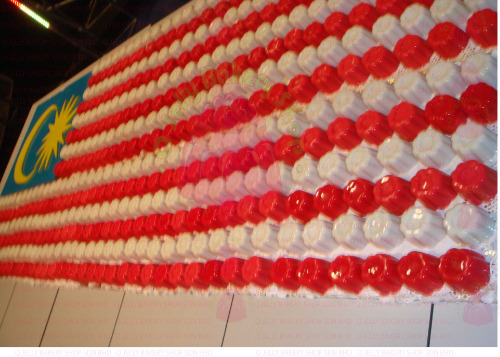 “Our customers need not fret about the colouring used in our cakes as they are all liquid-based colouring from the US, approved by the FDA, and made specifically for cake decorations. 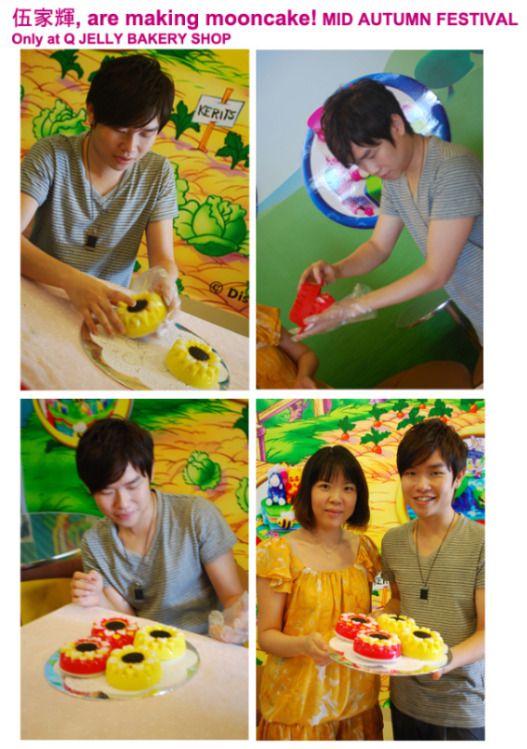 Besides, the jelly used in the cakes is made of seaweed which makes them a healthy choice,” Stephanie added. Cakes are designed by Stephanie herself. “I usually do a sketch and then my chef and I will try working on it using jelly.” Inspiration comes from outings to shopping malls. One jelly cake that will pique the interst of customers is a cake that features a Barbie doll in a split position — Flexi Barbie! How long would each cake last? “Since I do not use any preservatives, they can only last for three days at most. However it depends very much on the kind of fridge a customer has. The fridge should not be filled with other foodstuff like vegetables and meat, as this could affect the taste and longevity of the jelly cakes. A temperature of 4­6 degrees Celsius is perfect for storing the cake,” said Stephanie. Each cake takes 3­4 hours to make, depending on the size, weight, design and flavour of the cakes. When done, they are stored in a fridge for six hours for the jelly to set. With a first purchase of RM50 or above, customers become eligible for a Q Card and stamp redemption scheme, and discounts on future purchases. Palm size jelly cakes are RM5 for Q Card members and RM6.50 for non-members. Stephanie said Malaysians are fast catching up with the people of Taiwan and Japan in eating and appreciating jelly cakes. The jelly cakes range in price from RM3.80 (for the small-sized cakes) to RM300 for tiered cakes usually for birthdays and weddings. Q Jelly Bakery Shop is open 10am to 10pm and is located at Ikano Power Centre, Mutiara Damansara, Petaling Jaya.